Welcome to the 2nd installment of the 3 part series ‘Discovering My Style’! If you’ve not had a chance to read the 1st part yet, go check it out at ‘Discovering My Style #1’ , to read more on finding my style in the world of fashion blogging, mixing colours, textures and prints, and for another look at the world’s best faux fur jacket… it really is the best. In part 1 I explained how over the series I would be showing you 3 outfits which are completely different, but I love equally, to experiment and have fun with clothes and show you it’s totally fine to mix things up and have a good old experiment! So, here we are with part 2, which is also in collaboration with the London vintage chain, Rokit. I thought this would be a great collaboration and tie in really nicely with this 3 part series as I also love vintage clothes and thought it would be the perfect opportunity to style a quirky and fun outfit made up of some fab vintage pieces. So just to give you a quick download on the brand, for those that may have not heard of them before!- Rokit started out with a market stall in Camden back in the 80’s and now have four stores across London, with two of their main stores residing in Camden and Brick Lane, Shoreditch. They have a huge collection in store and online of hand picked retro pieces from the 30’s through to the 90’s. They also have some amazing branded items including pieces from: Tommy Hilfiger, Levi’s, Ralph Lauren, Carhartt, Patagonia and The North Face. You can check out their website http://www.rokit.co.uk to have a browse through their vast collection! 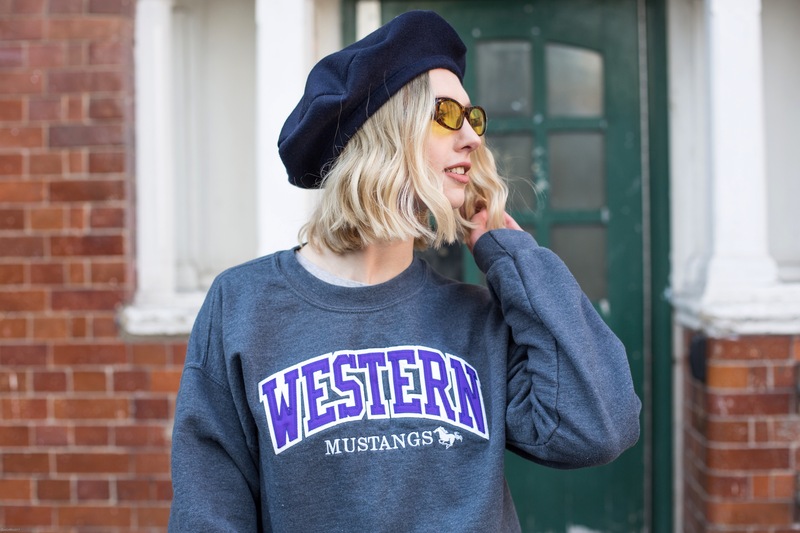 I was given the chance to pick a few bits off their website, so I opted for a super cute Tommy Hilfiger t-shirt, a collegiate style sweater and a pair of carhartt dungarees. If you follow me on Instagram and keep up with my stories, than you may have seen how excited I was to receive the package and how IN LOVE with the dungarees I was. However, unfortunately they were WAY too big for me, and when I mean big I mean across between a tent and a hipster Ronald Mc’donald kinda big, so I was a bit gutted. But, not to fret, I was down in London to shoot the outfits for this series, so had the chance to go into their Brick Lane, Shoreditch store to quickly exchange the dungarees before the shoot. I’m not going to lie, it definitely all worked out for the best. I found some fab flared trousers, an amazing quality wool beret, and the sassiest sunglasses you will ever find. So I walked away from the shop, having had a really nice experience as the store assistants were super friendly, with some amazing new vintage steals to replace the dungarees. The Tommy t-shirt, with the little logo is possibly my favourite item as it’s such a wearable classic. For this outfit, I decided to tie it in a knot to show off the flares a bit better and to avoid a horrible bunched up attempt at tucking it in. However, I’ve since worn it tucked into blue mom jeans, which worked prettyyy well if I do say so myself and gives a definite Rachel from friends kinda vibe. I’m also an absolutely sucker for a grey sweatshirt, so this has also fast become a firm favourite of mine (I’ve not been wearing it like everyday since I got it I promise) *looks up to the left, indicating I’m definitely lying*. Plus the addition of the snazzy (Yes I just said snazzy) sunglasses and the beret just topped it off for me, I mean a girl can never have enough beret’s in her collection right? I also feel like I shouldn’t neglect the beauties which were these navy flared trousers, which fit like an absolute dream. I think they were part of the Rokit recycled section as they came in loads of different colours and prints in store! Overall, I absolutely LOVED this outfit and felt so sassy in it. I decided to push myself out of my comfort zone a bit, namely by the addition of these rather ‘extra’ sunglasses to create this look, but I was totally feeling it. I want to say a big thanks to Rokit for letting me pick some amazing items and I will definitely be shopping there again! *Disclaimer- I was kindly gifted with all the items in this post marked with a (*) from Rokit, however all opinions are my own and I was not paid to write this post.